How, exactly, do you spell “Coocoo” anyway? Never mind. Today’s post is in honor of the fabulosa Meal Planning 101 workshop I taught two nights ago in my cozy living room. Together with Ana, Jackie, Denise and Rebecca (hi mamas!) a productive evening of learning, laughing and–of course–eating was had! I found this recipe online (and then modified it, what a shock) when I realized I had a half of a pomegranate that I needed to use up. This fruit is beautiful and grows literally in many So-Cal folks’ backyards, although mine was purchased from the farmers market. Takes a little work to get these glorious seeds freed from their fruit-home, but if you ask my girls, it’s tooootally worth it. Ingredients: 1 cup couscous, veg or chicken stock, several fresh mint leaves, 2 fresh oranges, fresh pomegranate seeds (about a 1/2 cup if you can swing it), 1-2 tbsp. white wine vinegar, 1-2 tbsp. olive oil, salt and pepper to taste. Directions: Prepare couscous according to package directions. You don’t have to use stock, but I like it better than water. When done, add diced mint (start with a little), pomegranate seeds, vinegar and olive oil. Squeeze your oranges and get some ‘a that juice in there (can use regular OJ too.) The original recipe called for one orange, and maybe mine were a little bland but I needed two to get that sweet zing that I was wantin’. Also add the vinegar and oil carefully. You’d be surprised how much vinegars can vary so it’s better to hit with just one tbsp. and then add more if you need it. There’s no going back if you add too much. Serve chilled/room temp. What I like about this salad: It’s so pretty! Also it was easy-tasty-healthy, which, if you know me at all, are my three favorite food adjectives. The I didn’t use as much mint as the original recipe suggested. I like fresh mint, but it can be overpowering if one is not careful. Oh. The original recipe also called for green onion, which I didn’t have. I had planned to add a bit of chopped white or red onion, but decided it wasn’t needed. I promised my workshop girlfriends that I’d post this for them as they were my officially samplers two nights ago. Thanks ladies! Check me out on Hometown Pasadena till next Tuesday if you’re in the mood for more online recipe-a-la-MIchelle fun. And I mean really, who couldn’t use a little more of that? En honor de Dia de los Muertos: que tengan muy buenas memorias de todos que ya han pasado. 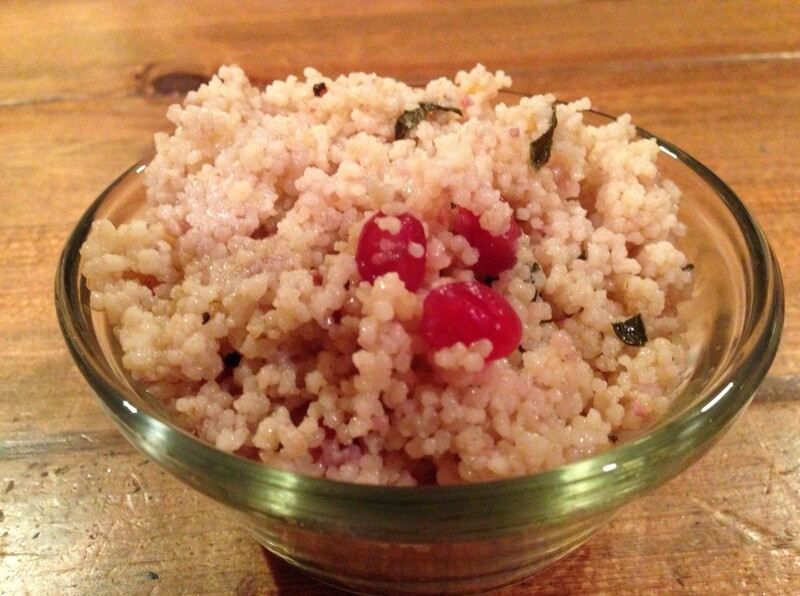 This is my new couscous dish. It took me 15 minutes to prepare and about five to clean up so there. And it’s nutritious. And my family liked it. Josie was only so-so but the other two asked for seconds. Two ‘outa three ain’t bad! 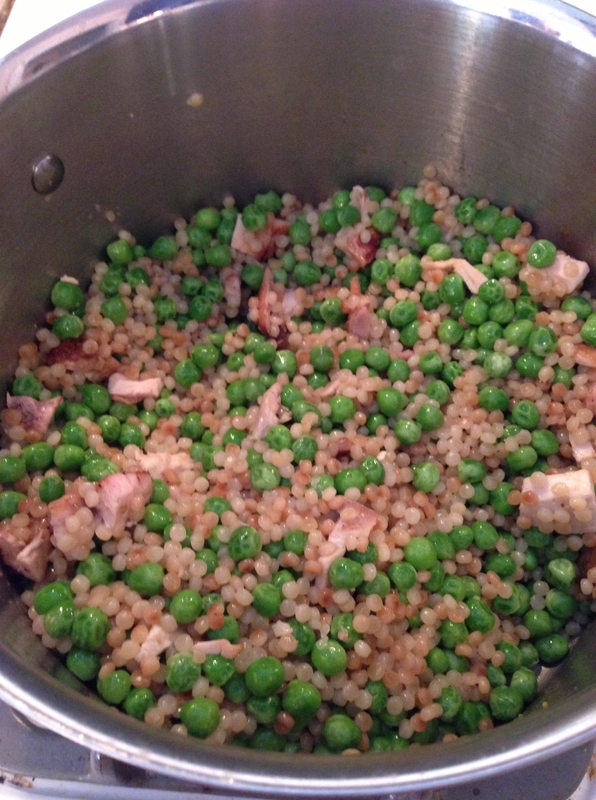 Ingredients: 1 16 ounce box of couscous cooked following directions with chicken broth instead of water, 1 bag of peas (steamed) diced leftover chicken. Directions: cook couscous according to what the box says. I always prefer mine with chicken or veg. stock instead of water but you do what you gotta do. When done mix in peas and chopped up chicken.